Change your thoughts, change your life. How you think and view the world affects the story that will be told about your life. Your story is one of three elements that can lead you to finding a breakthrough – that is, learning how to create lasting change in your life. Want to change your life? Then learn how to change your story. What we tell ourselves is what we believe. We often limit ourselves by deciding we can’t do something before we even try. We may ask ourselves, “Why bother?” or tell ourselves, “This is silly.” When we do this, we are effectively telling ourselves the answer is “no” before we even ask the question. When we do that, we’ve stopped our growth and our path to success. Our story affects what we do, where we go and how we approach life. A powerful story leads to a life of opportunity – change your story, change your life.The first step in changing your story is to stop telling yourself disempowering ones. How many times have you said something like this to yourself¹? I have to be perfect… I’m too old… I’m just not that kind of person. These are exactly the type of damaging thoughts that keep us from achieving our goals and, ultimately, our dreams. By addressing the following damaging thoughts head-on and treating ourselves with kindness instead of doubt, you can change your mindset and change your story. Perfection is the lowest standard anyone can have – it leaves no room for growth. While completing a task perfectly may feel good for a little while, it’s through our mistakes that we develop our greatest strengths and find life’s greatest lessons. If you have done something perfectly, you haven’t really learned anything – how to do this task better, for example, or what to avoid. By telling yourself you have to be perfect, you’re putting limits around your own capabilities. Rather than striving for perfection, strive for a balanced life. Accept that you will make mistakes and when you do, use them as a starting point to realize your next level. Trying to be perfect stems from one’s fear of failure. Instead of being afraid to fail, pursue your passion no matter the outcome. Everyone is fighting their own battle. It’s how you choose to handle difficulty that determines how to change your life around. A hard life doesn’t prevent you from success unless you tell yourself it will. Reality always catches up with us. While we can sometimes pretend they aren’t there, our problems will always be waiting for us when we return. It’s only when we choose to face them head on will they truly go away. Do you think you’re too old to rewrite your story? You can do whatever you desire at any age – as long as you believe it to be true and put in the work to make it a reality. By telling yourself that you aren’t “the happy type,” you’re making yourself unhappy. Happiness is a choice we make – it is a state we can become through our actions. The path to happiness is more than material items and superficial things. Rather, happiness is an all-encompassing way of being. Change your thoughts, change your life – that is, choose to be happy and watch as your negatives shift to positives. As achievers we all seek greatness, but is there something holding you back from your next level of success and fulfillment? 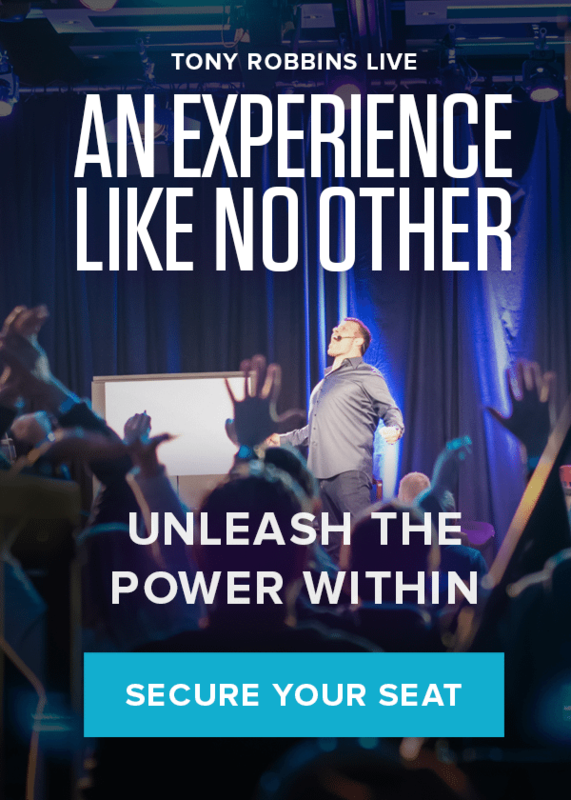 Overcome the story that limits you while creating your own breakthrough at Unleash the Power Within with Tony Robbins.